INTRODUCTION: A laparoscopic approach to pancreatic disease is increasingly performed although its ultimate benefit is yet to be confirmed. Laparoscopic distal pancreatectomy with or without splenectomy is gradually gaining acceptance as an alternative to open resection in selected patients. 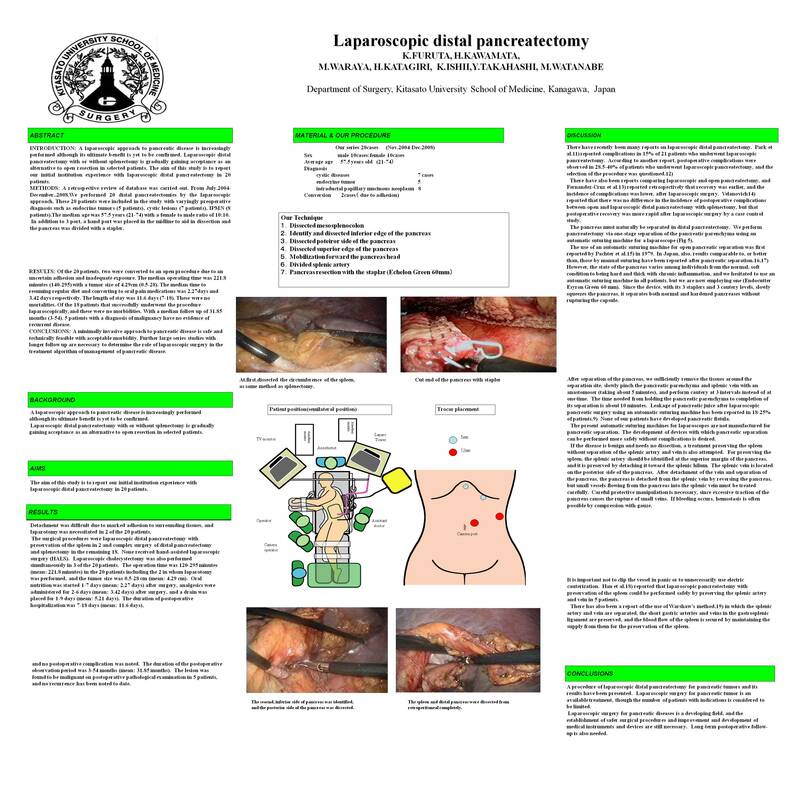 The aim of this study is to report our initial institution experience with laparoscopic distal pancreatectomy. METHODS: We performed 20 distal pancreatectomies by the laparoscopic approach. These 20 patients were included in the study with varyingly pre-operative diagnosis such as endocrine tumors (5 patients), cystic lesions (8 patients), IPMN (7 patient).The median age was 55.5 years (31-74) with a female to male ratio of 11:9. RESULTS: Of the 20 patients, two were converted to an open procedure due to an uncertain adhesion and inadequate exposure. The median operating time was 194 minutes (120-600) with a tumor size of 3.96cm (0.5-10). The length of stay was 10.1 days (5-17). These were no morbidities and no mortalities. Of the 18 patients that successfully underwent the procedure laparoscopically, and these were no morbidities. With a median follow up of 34.6 months (1-53), 4 patients with a diagnosis of malignancy have no evidence of recurrent disease. CONCLUSIONS: A minimally invasive approach to pancreatic disease is safe and technically feasible with acceptable morbidity.